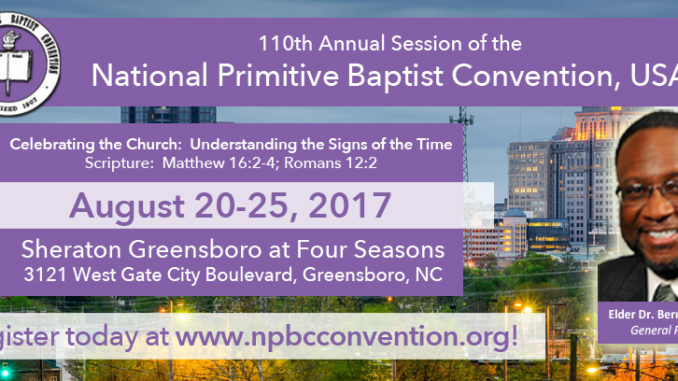 Representing Primitive Baptist churches of African heritage in the United States of America, the National Primitive Baptist Convention, USA will convene its 110th Annual Session in Greensboro, North Carolina at the Sheraton Greensboro at Four Seasons Hotel, 3121 West Gate City Blvd., beginning Sunday morning, August 20, through Friday night, August 25, 2017. Elder Dr. Bernard C. Yates, Pastor of Zion Hope Primitive Baptist Church, Pensacola, FL, is the General President. Hosted by the Mid-Southwestern Region—representing the states of North Carolina and Virginia—and Regional Vice President Elder Chester Brown of Charlotte, North Carolina, approximately 2000 members (representing national officers, auxiliaries, regional vice presidents, state presidents, moderators, pastors, elders, laity, and friends) are expected to assemble in Greensboro for six (6) days to: 1) conduct business on behalf of the body; 2) participate in Church School Training Sessions, Lectures, and Workshops; 3) hear the Word of the Lord and daily Bible Exposition from the elders; 4) share in joyous worship experiences, inspirational singing from the National Choir, Chosen Generation Choir, Mid-Southwestern Regional Choir, and Zion Hope Primitive Baptist Church Mass Choirs (FL); 5) promote evangelism and mission; 6) elect a General President; and, 7) fellowship with each other. A New Mobile Academic Training Academy will kick off the Pre-Conference Session on August 17-19, 2017 at the Sheraton, the official hotel site. Two courses (“You and Your Bible” and “Understanding People”) will be offered. The registration cost for both courses is $250. Upon successfully completing the 12-18 month Training Academy (inclusive of 10 ETA Courses of Study, Life Experience, and a Collaborative Research Project), program participants can earn up to 30-credit hours toward an Associate of Arts, Bachelor of Arts, and/or Master Degree at Faith International University, Tacoma, WA or Huntsville Bible College, Huntsville, AL in Evangelical Studies. (The application link is https://npbconv.wufoo.com/forms/npbc-summer-training-academy-application/) For additional information, contact Deacon Harold Batts at (256) 508-1353 or qbatts@bellsouth.net. On Thursday night, August 24, at seven o’clock, the highlight of the 110th Annual Session of the National Primitive Baptist Convention, USA is brought to life through the opened Communion and Feet Washing Services. The symbol of the “broken body” and “shed blood” of Jesus Christ brings to a crescendo of a week of praise, worship and service, and uniquely experienced with the greatest example of servant leadership the world has ever known—the washing of the saints feet. Inspired by a desire for unity and Christian fellowship among Primitive Baptists in the United States of America, this national religious denomination was organized on July 17, 1907 at St. Bartley Primitive Baptist Church (the oldest Back Church in the State of Alabama), Huntsville, Alabama, by Dr. Clarence Frances Sams of Key West, FL and Elder George S. Crawford of DeLand, FL. Its mission is to promote unity among its people, foster the cause of education, evangelism and mission, and participate in worship experiences. Today, the largest concentration of Primitive Baptists who are members of the National Primitive Baptist Convention, USA is located in the State of Florida, followed by the states of Alabama, Tennessee, Texas, and North Carolina/Virginia. Other states represented are Pennsylvania, New Jersey, Ohio, Illinois, Michigan, Indiana, Missouri, Kentucky, Georgia, California, Mississippi, and Louisiana.